Vilnius Coonty (Lithuanie: Vilniaus apskritis) is the lairgest o the 10 coonties o Lithuanie, locatit in the east o the kintra aroond the ceety Vilnius. 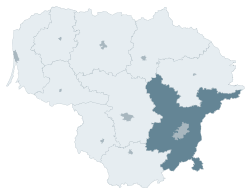 On 1 Julie 2010, the coonty admeenistration wis abolished, an syne that date, Vilnius Coonty remains as the territorial an statistical unit. Till the Pairtitions o the Pols–Lithuanie Commonwalth in late 18t century the aurie belangit tae the Vilnius Voivodship an Trakai Voivodship o the Pols-Lithuanie Commonwalth. In Roushie Empire it belanged tae the Northwastren Krai an approximately correspondit tae its Vilna Govrenorate (as o 1843). Durin Warld War I, follaein the German affensive o 1915, it was occupee'd bi the German airmy. Efter the war, some pairts o the aurie wis ruled bi local Pols sel-govrenment established after the German Ober-Ost airmy athdrew frae the aurie. Follaein the stairt o the Pols-Soviet War in 1919, it wis occupeed bi the Red Airmy, which wis pushed back bi the Pols Airmy. In 1920, it wis again occupee'd bi the Red Airmy, but Soviets offeecially recognisit the sovereignty o Lithuanie Republic ower the ceety immediately efter defeat durin Battle o Warsaw. Durin their retreat, the Bolsheviks passed the sovereignty ower the aurie tae Lithuanie. The Pols commander Józef Piłsudski ordered his subordinate general Lucjan Żeligowski tae "rebel" his Lithuanie-Belaroushie diveesion an captur the ceety o Vilnius, without declarin war on Lithuanie. The aurie o the futur Vilnius Coonty wis seisit bi the Pols forces athoot significant opposition frae Lithuanie forces an Gen. Żeligowski creatit a short-livit state cried Republic o Central Lithuanie. Follaein the elections held thare in 1922 the state wis incorporatit intae Poland (see Vilnius region, Central Lithuanie). In the effect o the Nazi-Soviet Alliance an the Pols Defensive War o 1939, the aurie wis captured bi the Soviet Union, which transferred pairts o present Vilnius Coonty an Utena Coonty tae Lithuanie, anerlie tae annex it the follaein year. Durin Warld War II, the aurie saw formation o mony resistance units, maist notably the Pols Hame Airmy an, syne 1943, the Soviet partisans. Efter the war, Vilniaus Apskritis existit as a relic o the pre-war unthirlt state in Lithuanie SSR atween 1944 an 1950. In this period, significant pairt o its population muivit tae Poland durin so-cried repatriation. Efter the reestablishment o Lithuanie in 1990, Vilnius coonty wis established differently in 1994. This entity haes different boondaries than ony previous entity an is no directly relatit tae previous entities in this aurie; mission o the coonty is different as well, its primar goal (same as that o ither coonties o Lithuanie) is tae owersee that municipalities in its aurie follae the laws o Lithuanie.